The WNBA playoffs were in full effect this weekend. We saw two series draw even 1-1 and we witnessed two eliminations in the Best of 3 series. On Saturday, the Atlanta Dream and Washington Mystics played Game 2 with the Dream with their backs against the wall and facing elimination. Angel McCoughtry’s messaged to her team before and throughout the game is to “play with heart.” The Dream showed a lot heart in this game and came out aggressive so that their playoffs presence did not end in DC. McCoughtry was so aggressive, she fouled out late in the fourth quarter. By that time though, even I could have been substituted in the game and the team still would have won. But it was not a joke just how bad the Mystics were, they were so bad that Coach of the Year, Mike Thibault tried to put on his tennis shoes and go out on the court. Ok, I’m joking but Thibault’s team was bad, the starting 5 was outscored by McCoughtry alone. McCoughtry continues to struggle with her shot but still managed to score 20 points in the game. She made everyone forget her 6/23 shooting when she drove to the basket and actually was going to attempt to dunk in the game. Luckily for her she was foul on the way up! Final Score: Dream won 63 – 45. The Sparks avoided elimination with their win on Saturday. For me, the key to the Sparks winning and league’s MVP Candace Parker winning her first championship is for Nneka Ogwumike to play well. Ogwumike contributed more and the Sparks got the victory. At the end of the first quarter, Oqwumike had six points and six rebounds. She finished with a double double 15 points, 11 rebounds. Candace Parker did what she does best, brought her A-game. Parker’s 31 points, 11 rebounds were too much for Diana Taurasi and the Mercury. Taurasi, who was unstoppable in Game 1, wasn’t able to dominate in Game 2. After the game, Taurasi talked about how the Mercury didn’t have any movement offensively. Well Taurasi moved around a lot, that would explain those 5 fouls she picked up in the game. She finished with 20 points for the stagnant Mercury. It was nice to see Brittany Griner put some points on the board, she finished with 18 points, 6 rebounds. Game 3 should be epic, I cant wait to see how Taurasi and Parker reacts to their team’s win or go home game. Final Score: Sparks won 82 – 73. The Chicago Sky made it to the playoffs for the first time in franchise history and it was also an early exit for Rookie of the Year, Elena Delle Donne and the Sky team. I was somewhat disappointed with this series, I expected for the games to be more balanced and entertaining. The Fever controlled Game 1 and Game 2 and reminded us of how and why they are the defending champions. Delle Donne was nonexistent in the second half of Sunday’s game, going scoreless in the half and watching her team get demonlished by Tamika Catchings and the Fever. Sylvia Fowles finished with 14 points, 14 rebounds for the Sky. I think the Sky has potential and we will be seeing more on them in next year’s postseason, if they build on this year’s team success. Catchings finished with a double double, her 49th career playoff double double to be exact, 18 points, 12 rebounds. The Fever advance once again to the Eastern Conference Finals. Final Score: Fever won 79 – 57. The outcome of this game made me sad, the last time we will see Tina Thompson on the court competing in the WNBA as she retires and move on to a different chapter in life. What a great career she has had, and she can still make an impact at the age 38 as we have seen this season as she helped lead this Storm team. 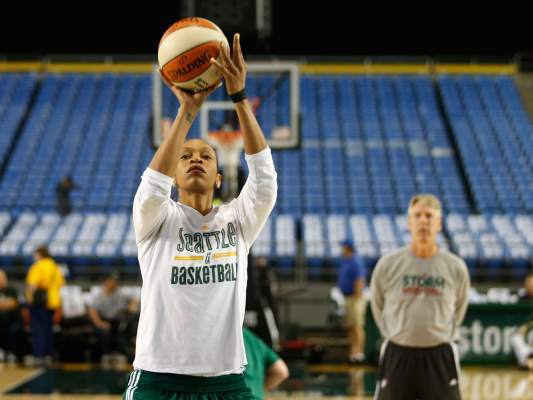 She retires after 17 years, as the WNBA’s career scoring leader and four-time champion. Thompson gave her best (13 points, nine rebounds), almost forcing a Game 3 in the series, by making a layup with 1:20 left in the fourth but Seimone Augustus responded with a jumper with 21.1 seconds left. Maya Moore and the Lynx have been dominated during the regular season and it has carried on to the playoffs. They advance to the Western Conference Finals and proves that they will be a tough match for either the LA Sparks or Phoenix Mercury. Moore finished with 22 points, 7 rebounds for the Lynx. Final Score: Lynx won 58 – 55.